Garlic is my best culinary friend. Whenever I’m trying a recipe that calls for garlic, I usually double the amount. I absolutely love it and love food that features it. Garlic fries, garlic soup, garlic bread, garlic butter. You can imagine how I felt about Ina Garten’s Chicken with 40 Cloves of Garlic. That recipe was so delicious that I began to wonder what other dishes might be good with 40 cloves of garlic. Any recipe that ever existed is my guess. On New Years Eve in 2012, Karl and I went to Thanh Long in San Francisco for dinner. When I opened up the menu, one item instantly caught my eye – garlic noodles. It was love at first sight. As expected, the noodles were delicious. Now that these noodles have entered my life, there was no way I could live without them. It was along the lines of a life-or-death situation – I had to learn how to make garlic noodles. I discovered that it was not difficult at all. When you’re working with garlic, the margin of error is quite large in my humble garlic-biased opinion. Bring a large pot of water to boil. Add the egg noodles and cook for 1-2 minutes, stirring frequently. 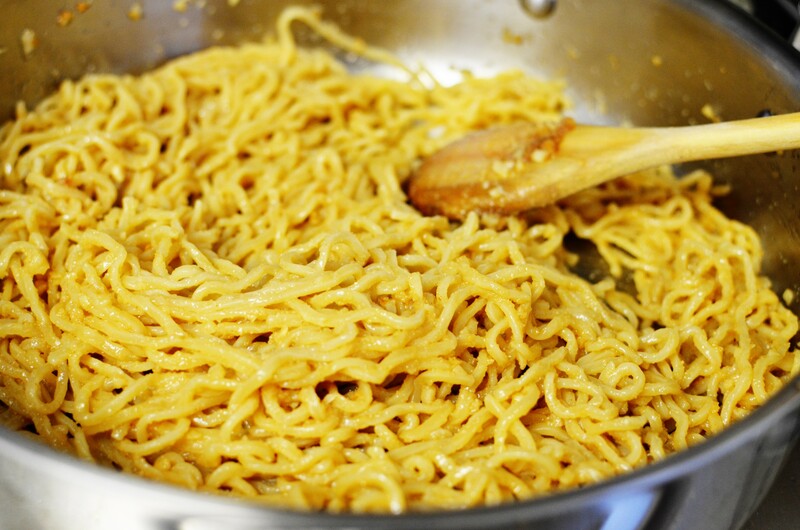 Drain the water and rinse the noodles thoroughly with cold water to prevent the noodles from sticking to each other. In a small bowl, mix together the garlic powder, chicken bouillon powder, and oyster sauce, then set it aside. In a saute pan, melt the butter with the olive oil over medium heat. 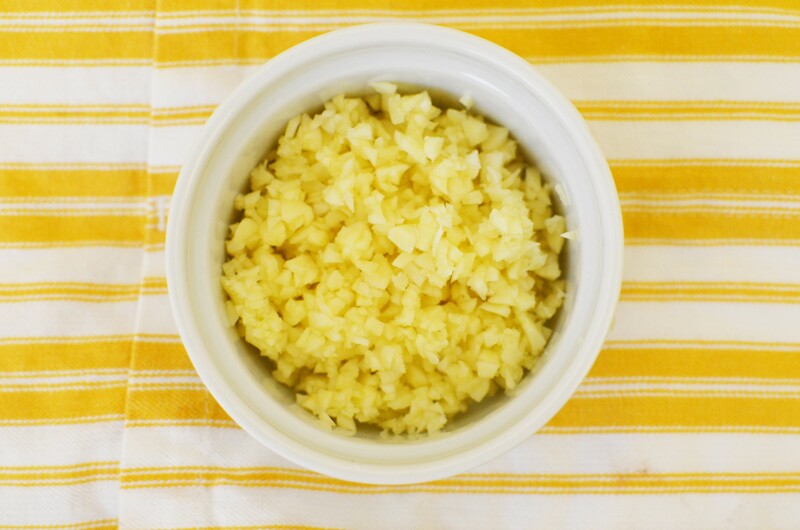 When the oil/butter is hot, add the minced garlic and cook it for about 2 minutes. Add the garlic powder mixture and cook for 2 more minutes. Add the noodles and Parmesan cheese, then mix with a spoon until all the noodles are evenly covered in the garlic sauce. Take the noodles off the heat and serve. When boiling the noodles, do not overcook them! Overcooking will make the noodles really soggy and hard to work with. This entry was posted in Sides and tagged noodles. Looks yummy!! Love all the pics and easy to follow directions!! Hello! 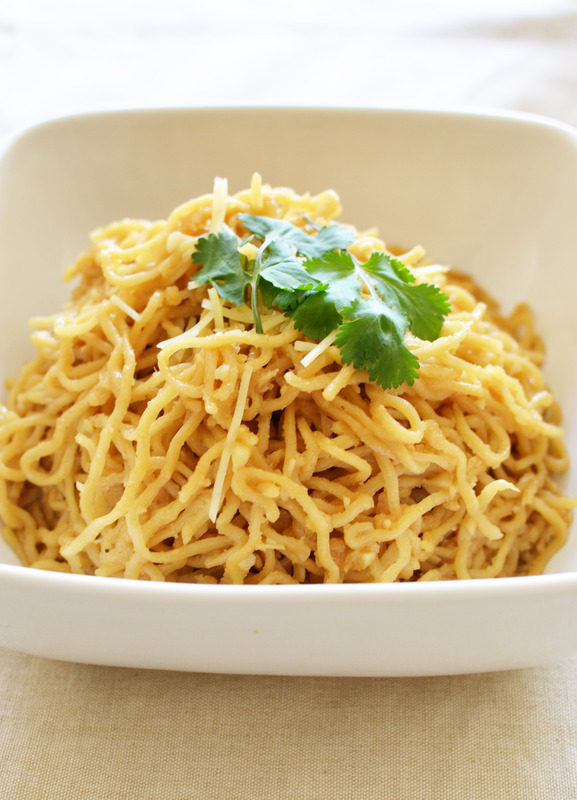 Of all the garlic noodle recipes I’ve tried from the internet, this is the best one by far! Thank you!